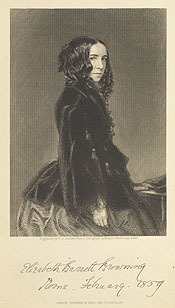 Elizabeth Barrett Browning was one of the most successful and respected poets of the nineteenth century. As a young girl she scorned the literary genres and modes of expression associated with womens writing and dreamed of becoming a great poet in the style of classical antiquity. There were no female models for such poetic ambition, but Elizabeth set to work. She read voraciously and studied Greekattaining a level of mastery almost unheard of in a woman. Aurora Leigh (1857), her most ambitious work, saw more than twenty editions by 1900. For most of the twentieth century, literary histories tended to mention her as an appendix to discussions of her husband, Robert Browning. 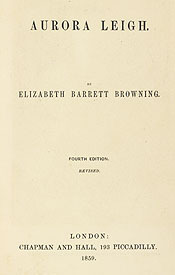 Her significant literary achievements were obscured until the 1970s, when feminist critics recognized Barrett Browning as a powerful, independent voice of social criticism and an innovative poet who anticipated movements in modern versification. Elizabeth Barrett Browning. Aurora Leigh. London: Chapman and Hall, 1859. Fourth edition, revised.